The best junior short track speed skaters will fight for World junior champion titles this weekend at the Maurice-Richard Arena in Montréal, Canada. Junior skaters from more than 30 countries including power houses of the sport such as Korea, Canada, China and the Netherlands are in Montréal for the 2019 World junior championships. Day 1 was the qualifying rounds on every distances. The competition started with the qualifying rounds on 1500m. Kamila Stormowska, Courtney Sarault, Li Jinyu, Seo Whi Min, Aoi Watanabe, Shione Kaminaga, Elisa Confortola, Xandra Velzeboer and Corinne Stoddard all won their quarterfinal races and are some of the names you should look out for tomorrow in the final rounds. As for the Canadians, all three skaters qualified. Sarault easily won her heat while Claudia Heeney and Juliette Brindamour were advanced after some race incidents. Some of the men’s 1500m qualifying races were already tight which should be the sign of an exciting weekend to come. Some skaters such as Japan’s Kazuki Yoshinaga, Canada’s Nicolas Perreault and William Dandjinou, Latvia’s Roberts Kruzberg and all three Koreans skaters Kim, Chang and Jung still managed to stand out and you should keep an eye on them. Canada’s Matej Pederson had a tough 1500m heat and didn’t manage to advance. His two teammates Dandjinou and Perreault qualified on the distance. The 500m preliminaries were fast and the majority of the skaters from the strong countries got through. The only surprise in the ladies’ 500m was that the Dutch Marijn Wiersma, who has some senior international experience and who performed well on 1500m earlier in the day, didn’t manage to qualify for the top bracket on the distance. All three Canadian skaters qualified. On the men’s side, the highlight of the distance was probably Roberts Kruzberg’s comeback in his heat. He started late probably thinking the race would be called back for false start but it wasn’t. He was able to catch up and executed three solid passes to finish second and qualify for the main event on 500m. The action will continue tomorrow on the distance. China’s Wang Pengyu, who skated at the Salt Lake City world cup this season was penalized and won’t be able to skate in the 500m main event. Crowd favorites Felix Pigeon and William Dandjinou did well and qualified while Matej Pederson suffered a fall. The ladies’ 1000m preliminaries were as calm as the ones on 500m as the skaters from Korea, China and Canada almost all qualified. Corinne Stoddard from the United States qualified in her third distance of the day on 1000m. ''Today my goal was to make it out of every distances which I did! My goal this weekend is to medal on any distance" says 17-year-old Stoddard. Courtney Sarault and Claudia Heeney from Canada will also both advance in all three distances as they won their respective 1000m heat. No big surprise either in the men's 1000m preliminaries, but watch out for outstanding racing in the main events of the weekend. 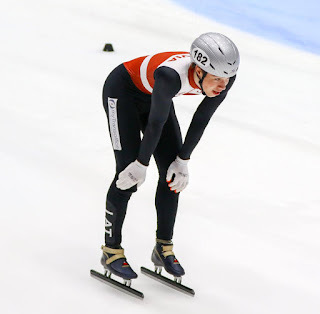 After a tough beginning in these championships not qualifying on 1500m nor 500m, Canadian Matej Pederson was solid on 1000m and managed to finish second of his heat to qualify for the main event on the distance. His teammate Nicolas Perreault also qualified but Felix Pigeon’s path on 1000m ended as he finished third of his heat. Korea, Canada, Poland, Kazakhstan, China, Russia, the United States and Italy managed to qualify for the ladies' relay semifinals. Team China established a new junior world record on the distance. The Koreans, big favorites for the win in the men's relay suffered a fall in the first laps of the first heat and won't be able to compete in the final rounds. In semifinals, Netherlands, USA, China, Kazakhstan, Japan, Hungary, Russia and Canada will have the chance to fight for the precious spots in the A final.